MONTREAL – It’s hard to appreciate the point you earned when you’re focused on the one that got away. 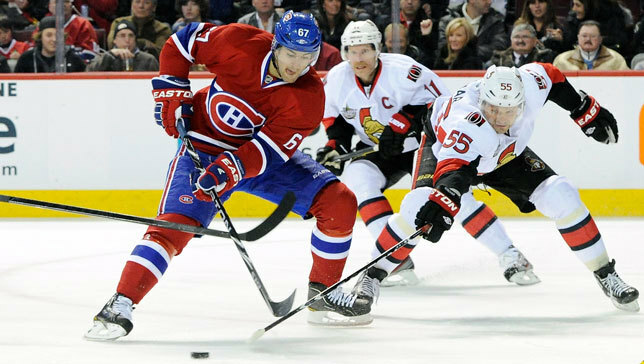 While the Canadiens showed some solid team grit and determination, fighting until the final seconds of Saturday’s tilt to tie the game, the shootout proved to be their undoing again in their season’s first loss to the Senators. “It’s hard to say why we’re having a tough time in the shootout. Sometimes you score and sometimes you don’t and it seems like this year, we’re having a hard time winning those,” said Tomas Plekanec, who stood out in Saturday’s game as the only Hab to register a plus-2 differential on the night. The Czech center would also log 25:46 of ice time – a team-high among forwards. Dropping their first of back to back weekend-games wasn’t how the Habs hoped to end their evening, especially after peppering Ottawa goaltender Craig Anderson with 35 shots over 65 minutes of hockey. The pressure the Habs’ bench boss referenced was ultimately what earned the Canadiens a trip to overtime and the single point when Max Pacioretty picked up a David Desharnais rebound and found the back of the Ottawa net with 39 seconds left on the clock. “I think we showed a lot of character getting that tying goal, and we never stopped trying for it, but we obviously need to be getting more goals and more wins,” pointed out Travis Moen, while also recognizing the effort is in place even if the results don’t always follow. Rene Bourque will get his chance to make an important first impact with his new team on Sunday evening when the Canadiens square off against the Eastern Conference leading New York Rangers.